Many guests visit Walt Disney World for runDisney ‘racecations’ throughout the year, whether it’s for the Walt Disney World Marathon, Princess Half Marathon, Expedition Everest Challenge, Tower of Terror 10-Miler, or Wine and Dine Half Marathon, but sometimes schedules don’t match up or you have other vacation priorities and the need arises to run while on your regularly scheduled vacation. Aside from logging treadmill miles, what’s a runner on vacation to do? At the Jingle Jungle 5K, 2012. Fortunately, there are a plethora of options – especially if you are staying on property at the Walt Disney World Resort. 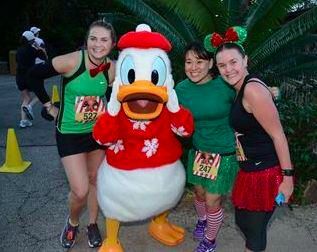 While your run might not include the requisite character greeting opportunities of a race, it will surely provide a magical start to your morning and planned activities. 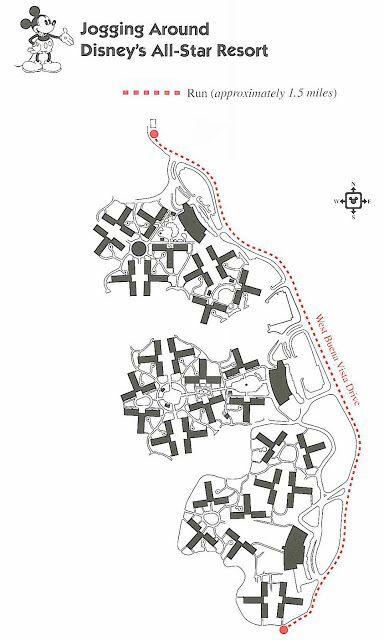 Each of the following recommendations include approximate mileage and terrain considerations and can supplemented with additional loops or out-and-backs on sidewalks and walkways within the confines of the resort area. 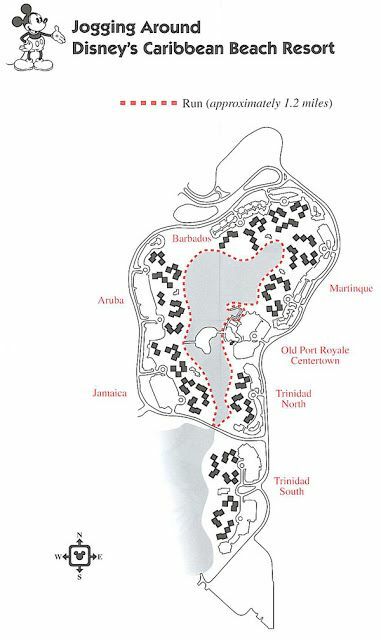 Maps may be requested upon arrival at resort front desks – the following images below have been complied from a variety of sources. Please exercise caution when utilizing shared spaces with maintenance vehicles and be courteous to fellow pedestrians. As in any other physical activity, please consult your physician before beginning a fitness routine. 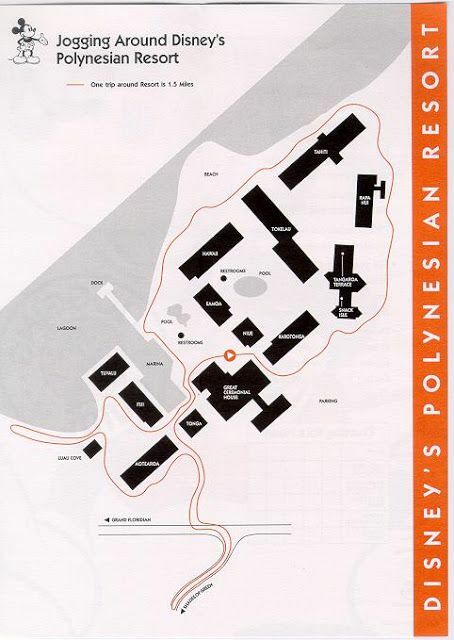 Suggestions: Add loops around the buildings and theming of the resort to get in some extra miles. If you’re someone that likes a leisurely run, do a photo scavenger hunt of fun sights along the way. Suggestions: Although the distance options are not plentiful at Disney’s Animal Kingdom Lodge, the spread-out nature of the resort lends to great indoor walking opportunities. Suggestions: Mix up loops and enjoy running over bridges and taking in water views. 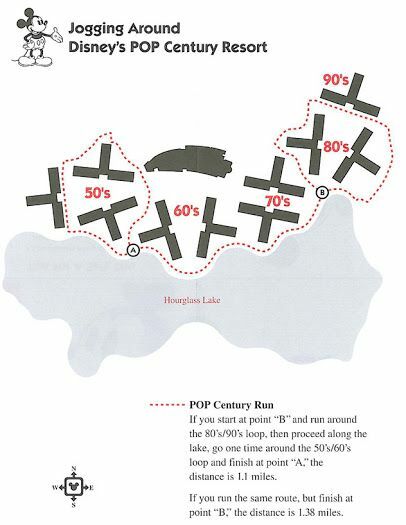 There are also many plaza areas tucked away along the route that can add fun and mileage. Suggestions: Quiet mornings are the best time to log some mileage in this area! 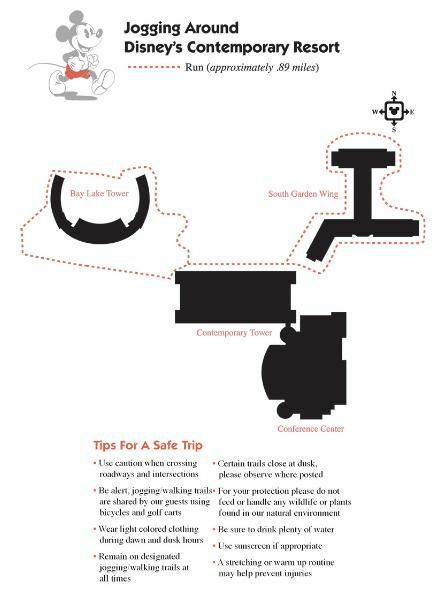 You can run around Crescent Lake, up and over bridges, and even down the canal area toward Hollywood Studios to your east, or toward the entrance to Epcot‘s International Gateway to the northeast. Suggestions: Exploring the Caribbean Beach area can be quite an adventure! Enjoy the water views, fort details and island feel. Distance: many options, from 2.5 miles (and shorter) to much higher, with added loops. Terrain: Part paved, part gravel. 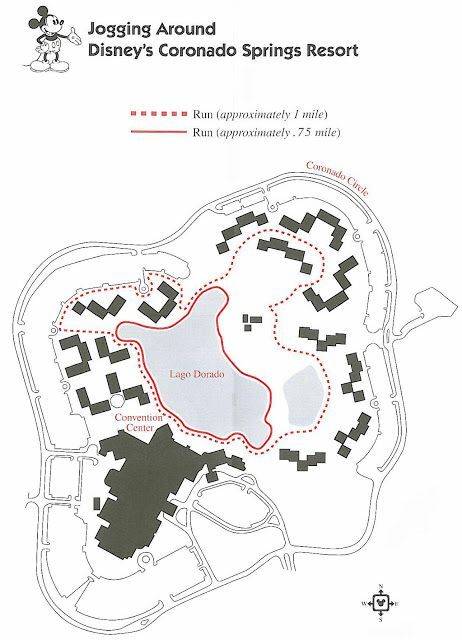 Suggestions: The Ft Wilderness /Wilderness Lodge area is, as one might guess, very wooded – bug spray and/or protective eyewear ir recommended in case of high insect areas. As in other paths that make contact with roadways, be mindful of others who share your paths. 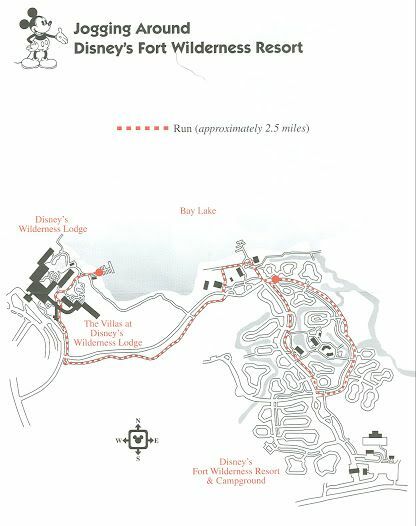 Suggestions: Depending on time of day, the out-and-back distance to the Magic Kingdom entrance and boat launches (about 0.5 mile one-way) can add some extra magic to your run! Suggestions: Mileage can be included with extra loops around the Grand Floridian, or added on after reaching the Polynesian. 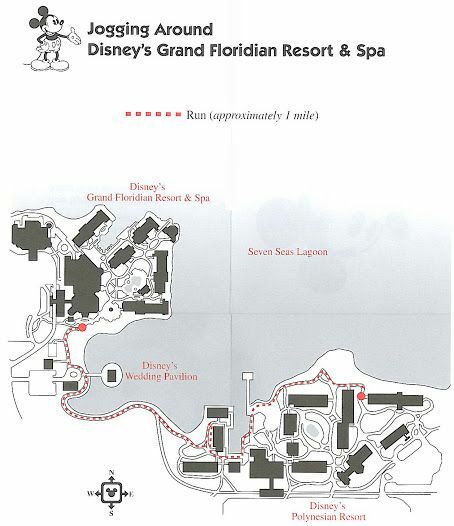 Suggestions: As with the Grand Floridian route, mix-ins to and fro, and around resorts can add miles. Bonus: kick off your shoes and do some strides on the beach! 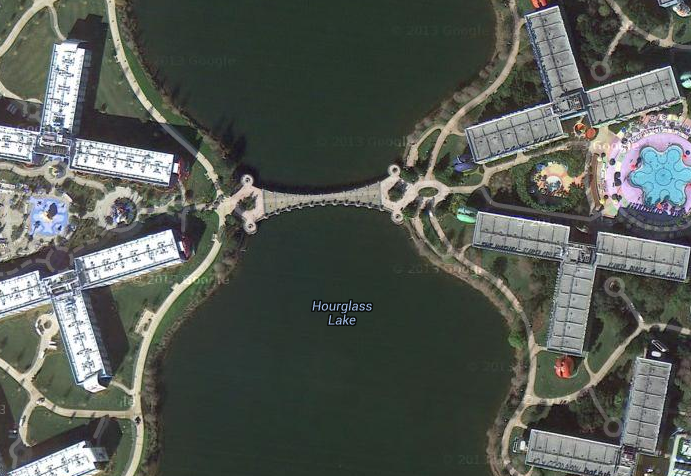 Suggestions: Whether you are staying at Pop Century or the Art of Animation Resort, you are welcome to cross the bridge over Hourglass Lake to enjoy a change of scenery and extra mileage. Take in the larger than life theming of both resorts and immerse yourself into the very different stories being told at each location! Suggestions: Take in the gorgeous views of Port Orleans between both sides of the resort. 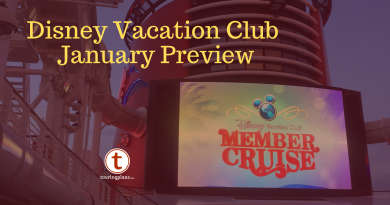 Suggestions: Enjoy the relaxed atmosphere of Disney’s version of Key West, taking in the views of canals and the fairways of Disney’s Buena Vista Golf Course. Add extra resort loops for mileage! Please note: golf cart paths are not meant for pedestrians. 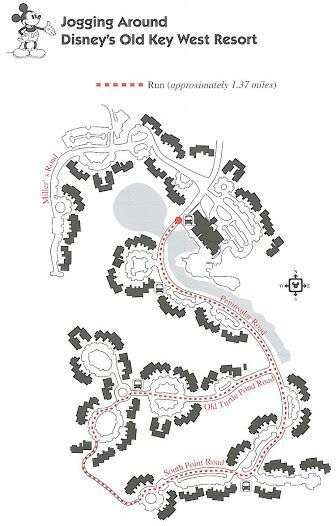 Suggestions: The main path around the resort is easy and marked – to add on some mileage, take the path to the east of the map onto a sidewalk that links the resort to the Downtown Disney area (parallel to Buena Vista Drive). Please note that some areas of Downtown Disney are closed in the early hours (opening times may vary, but are generally around 9:30 AM) and you may need to take sidewalks around the main area. You may also take the sidewalks down Hotel Plaza Blvd (they are lit) for more distance. 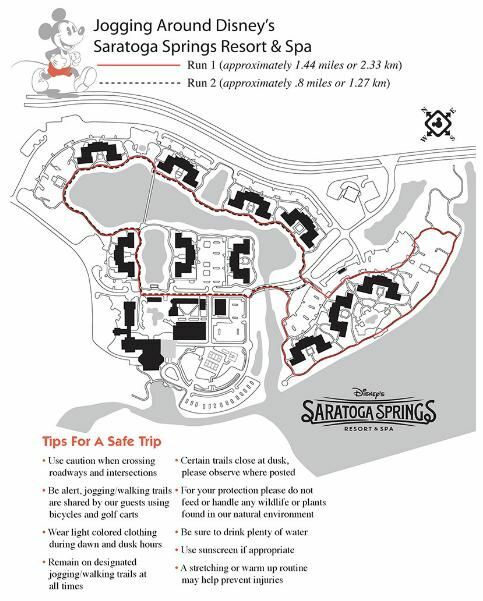 Starting (or ending) your Disney day with a run can be a great way to maintain your fitness routine, so next time you’re at Disney, why not check out one of these routes. 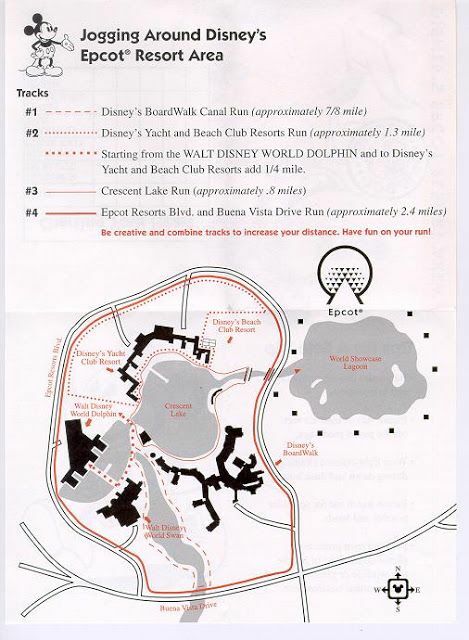 Or, if you’ve run at Disney before, did we miss anything? Let us know in the comments! How Much Can You Do During a Disney Vacation? Thank you so much for this post! I participate in many of the runDisney races, but have found myself “lost” when I want to get in regular runs during non-race trips. I’m staying at one of the All Star resorts next month for a work-related trip, so this information is just what I needed! Love that towel tip, Marc! Thanks for stopping by and sharing your route!! Thank you for the great information! I am headed to Disneyland in a couple of weeks, do you know where to run in Disneyland? Hi, Beth! I run at Disneyland often, where are you staying? When I stay at the Grand Californian, I usually head out of the DTD walkway, and run toward the DL Hotel, do a few loops out there (or add on the sidewalk toward the Mickey & Friends parking structure) or run toward the parks, through security and the park entrances, down the Espenlade, turn right onto Harbor, then right at Katella and back around. The cool thing about DL is that the property is basically contained within a big rectangle (search for DL on Google Maps) so you can make some routes up pretty easily. Businesses and residence surround the area, so it is pretty safe (I’d recommend waiting til it’s light out, however). 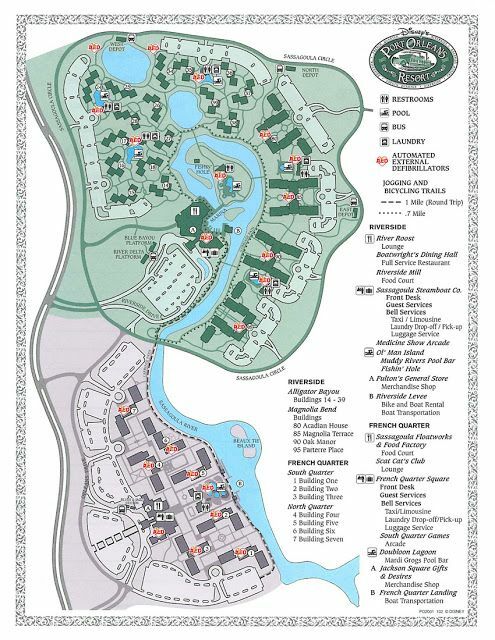 I’ll add that the All-Star Resorts are connected to Coronado Springs Resort via roadside sidewalks, with crosswalks at lights where street crossings are required. You go by the McDonald’s and Blizzard Beach. When I’ve stayed at an All-Star Resort, running to Coronado has been a great way to get some extra miles and different scenery. I’ve found other ways to run between resorts, but this is one that is safe (you’re on sidewalks or crosswalks the whole time), and you won’t get yelled at by Disney Security. Ms Murphy I’ll be spending a winter month next year off site with no good option for a daily run. I’ll be close to DWD and would enjoy running on property. Is this allowed? Great! Thanks for your quick response.